When three Kiwi guys returned home one day they started seeing their own country a little differently. They had been travelling the world for years and like all Kiwi’s, proudly and passionately told people about New Zealand whenever asked. 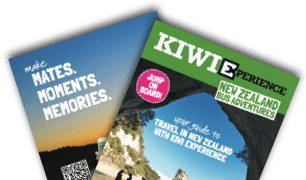 Upon returning though they knew there was a better way of showing it to the world and began dreaming up a new way of providing truly flexible New Zealand bus travel for independent travellers. Not tours, but unique trips linking New Zealand's scenic and adventure attractions, taking time to stop and take it all in, sharing the best kept secrets, and giving travellers a chance to experience the very best of New Zealand. In December 1988 they started to make it happen. A famous dog was there too named Gyro who shouldn’t be forgotten, especially as many suspect he was the brains behind the operation. Then, on 28th October 1989 the very first Kiwi Experience trip departed with a full bus to travel New Zealand they best way they knew how. The legend had begun, word of mouth quickly spread, and tourism accolades rolled in. Hop-on, hop-off bus travel had been invented and travellers from all over the world loved it. This would cement Kiwi Experience’s place as a New Zealand tourism icon for all the years to come. We are still a bunch of proud and passionate Kiwis providing New Zealand bus travel to the world – over 500,000 passengers at last count. The team has grown significantly to keep up with demand but has retained the original vision of showing each and every traveller a mind blowing experience while here. The bus passes too have been refined over time to ensure we continue to cover all the best parts of the country – the must see NZ icons, the unique hidden experiences off the tourist trail, and immersing travellers in New Zealand culture rather than having them watch it in a show. 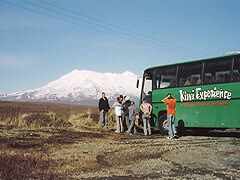 Kiwi Experience has a fantastic adventure travel network, a legendary story, and is here to stay. We're damn proud to be different, and damn proud to show you New Zealand. Whether it's jumping out of an aeroplane, experiencing a marae, or simply lying on a beach reading your favourite book, we'll make it happen, we'll make it fun, and most of all we'll make it unforgettable! This is our Kiwi Experience story. We can’t wait to hear yours. You can feel good about travelling around New Zealand on the big green bus! As a company, we're always working on new ideas about how we can be environmentally and socially responsible. Our efforts have been recognised by a big thumbs up from Qualmark. 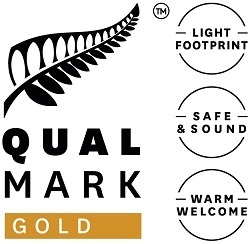 Qualmark is New Zealand's official mark of quality for tourism operators and we've scored an Enviro Gold endorsement for responsible tourism. Today Kiwi Experience is part of New Zealand’s premier tourism operator group – Tourism Holdings Limited (thl). thl started as a helicopter business used by hunters to recover deer in remote bush land. They then began taking small groups of people on scenic flights. Now they’re one of New Zealand’s leading tourism companies, and we’re stoked to be a part of it! One of the biggest reasons Kiwi Experience – and thl - are successful is due to our extensive partnership network and years of tourism experience — we know what makes our customers tick. We're a pretty laid back bunch, but we know how important your New Zealand trip is for you; so we're going to make sure you get the best service and product possible - come see for yourself.